In terms of toy lines based on the MCU, Thor seems to draw the short straw. Hasbro went all-in for his first film, and produced a rather expansive line. Sadly, this one proved to be less than successful, which made retailers a little bit wary of backing him for later films. Dark World only got a very small assortment and Thor himself was only offered in an online-exclusive boxed set for Age of Ultron. For Ragnarok, there’s a bit more coverage, but we still only got a small fraction of the main cast. 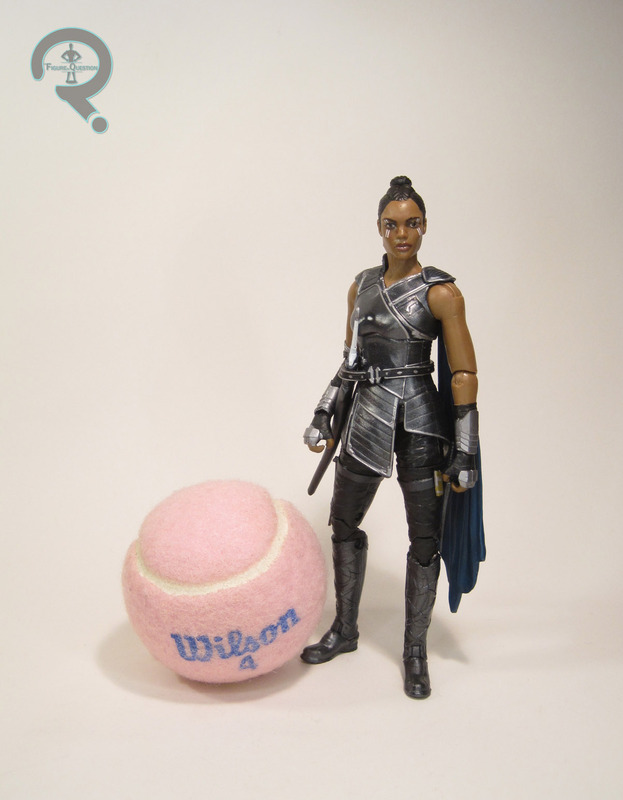 For instance, Valkyrie, one of the film’s main protagonists, was only available in a two-pack with a variant of Thor. 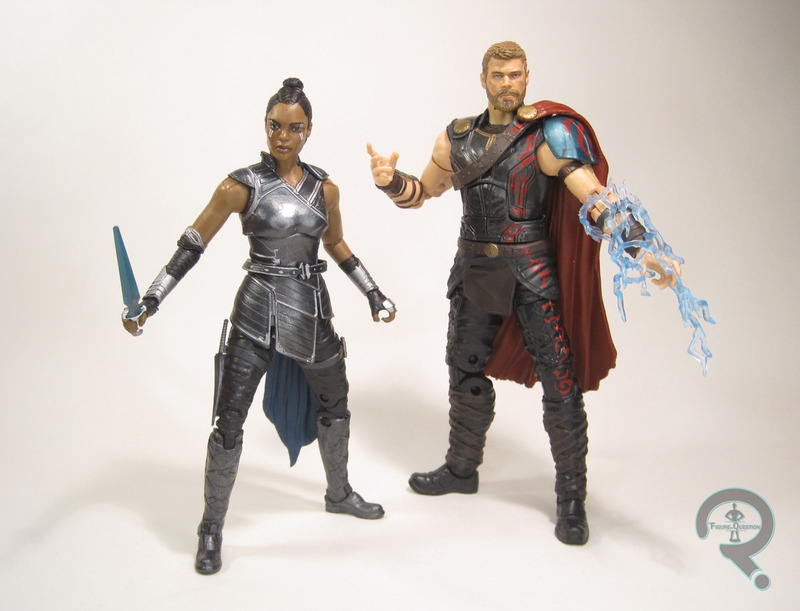 Thor and Valkyrie are a two-pack of figures from Hasbro’s currently running Marvel Legends. Like the prior Star-Lord and Ego pack, these two aren’t exclusive to any one retailer. Unlike that earlier set, these two actually hit in time for the movie, arriving on shelves about a week before the movie. Thor gets quite a makeover in Ragnarok, and this figure replicates that new look. I know a lot of people weren’t really big on the new short-haired look, but I didn’t mind it too much, and I certainly liked Thor’s new gladiator gear. This figure makes use of a lot of the single-release Ragnarok Thor’s pieces. Mostly, this one’s just got a new head to differentiate him. The figure stands just shy of 7 inches tall and he has 30 points of articulation. The new head is obviously the star piece here. 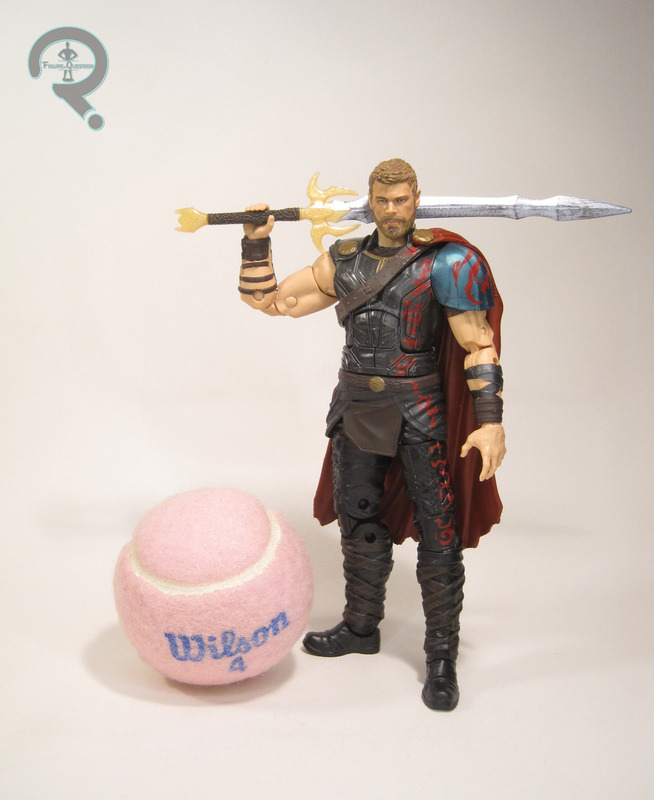 It’s not a bad likeness of Hemsworth; definitely the best we’ve gotten so far from Hasbro, I’d say. It looks good head-on, I think it’s just the profile that throws it off. The body sculpt is pretty decent, but I noticed similar issues with the torso to what was going on with the Loki figure. He just seems a touch flatter than he should be. I also found the cape to be a little too detached and easy to fall off for my taste. On the plus side, the figure’s paint is pretty top-notch. The face is the best work, rendering a rather life-like take on Hemsworth. The body gets the bold color palette down, and I quite like the red detailing that runs down his left side. That’s a fun touch. Thor doesn’t include his usual hammer (since it was destroyed and all), but he does get an extra set of open hands, a lightning effect piece, and, somewhat oddly, Heimdall’s sword. Not sure why that last one came with Thor and not, say, a Heimdall figure, but there it is. Thor’s great and all, but the real draw of this set is definitely it’s new character, Valkyrie. I was quite a fan of Tessa Thompson’s take on the character, and I’m eager to see the character turn up in future films. And I’m also excited to have her in figure form. Valkyrie is seen here in her bounty hunter garb from the first chunk of the film. It’s the look she spends the most time in, and is also pretty close to her current comics look, so it’s a good choice. The figure stands about 6 inches tall and she has 27 points of articulation. Her sculpt is completely unique to her, and it’s definitely a very nice one. It’s certainly my favorite of the Ragnarok sculpts I’ve seen, that’s for sure. The likeness on the head is a pretty solid match for Thompson, and she’s sporting a pretty balanced and realistic set of proportions. The cape is permanently affixed, which I like more than the removable capes of Thor and Loki. I wish the knives strapped to her legs were actually removable, but at least they’re actually there. In terms of paint, Valkyrie’s pretty decent, with clean application and solid color choices. My only real complaint is the small bit of splatter on her forehead, which is a little bit distracting. Valkyrie is packed with her valkyrie sword, as well as its scabbard, which doesn’t seem to actually have anywhere to go. I saw this set a few times before the movie’s release, always in rather large quantities. After seeing the film, I came across it again at my local Target, but this time there were only two of them left. Since I really enjoyed the film (and Valkyrie in particular), I figured I should probably grab them while I could. Valkyrie is definitely the stronger of the two, but Thor’s still a solid figure in his own right.